Participatory action research is a qualitative research method conducted in collaboration with a community of people in order to effect changes in the community that are relevant to the residents. 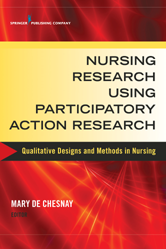 This is a practical, "how-to" resource for conducting participatory action research that guides readers, step by step, through planning, conducting, and disseminating nursing research using this qualitative design. It is part of a unique series of seven books devoted to nursing research using qualitative designs and methods.